In the early 1890s, Boyle Heights and Los Angeles were experiencing some tough times. A growth boom, often called the Boom of the Eighties, erupted a few years previously, peaking during the 1887-88 mayoral term of Boyle Heights founder William H. Workman, but it went bust by decade's end. This detail from a Los Angeles Herald article, dated 14 January 1892, discusses the establishment of the boundaries for the new Hollenbeck Park, on land donated by Boyle Heights founder and former Los Angeles mayor William H. Workman and Elizabeth Hollenbeck, with the park dedicated to the latter's late husband, real estate investor and banker, John Hollenbeck. The article was obtained from newspapers.com. Click on any image to see them in enlarged views in a separate window. Consequently, creative efforts were made to kick-start the community's development and one way to do that seemed to have been to enhance the neighborhood's infrastructure by establishing a city park. The establishment of a community park was also a reflection of citywide effort to establish these "pleasure grounds" as part of a national "city beautiful" movement that encouraged healthful and attractive oases in urban environments. Consequently, several parks sprung up in the city during the late 1880s and early 1890s including Westlake Park, Elysian Park, Griffith Park and others. Workman and Elizabeth Hollenbeck, whose late husband John invested heavily in Los Angeles-area real estate and banking before his 1885 death, agreed to donate fifteen and ten acres, respectively, to the city for a new Boyle Heights park to be dedicated to John Hollenbeck. The main condition was that the city commit to spending $10,000 over two years for improvements and the council approved the proposal by early 1892. 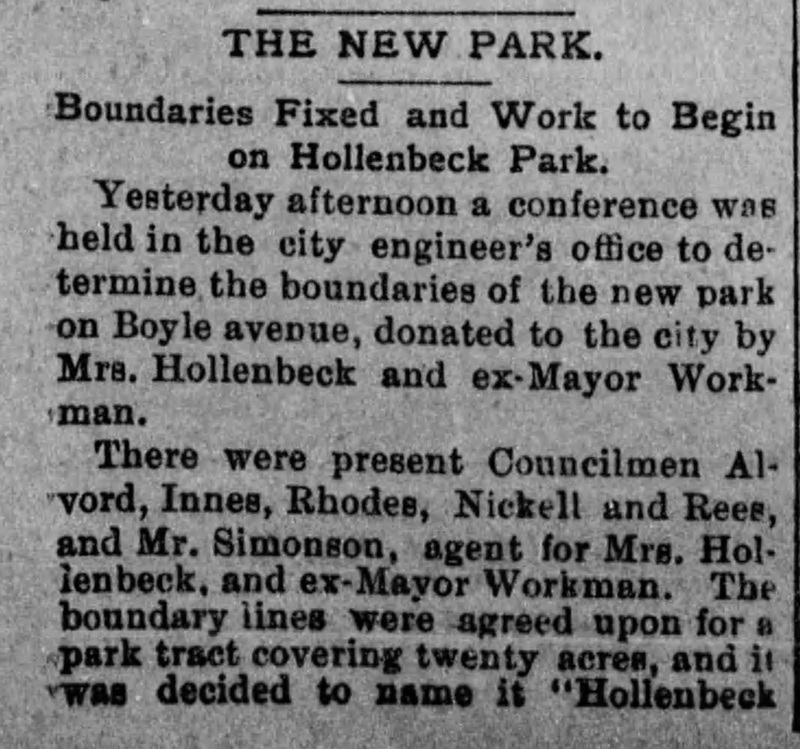 Some of the details of the new Hollenbeck Park are given in this excerpt of a long article in the 26 March 1894 edition of the Herald. From newspapers.com. Some members of the city's park commission, however, were less than enthused by the deal, especially the financial commitment, given that there was an established budget with funds earmarked for existing parks and those that were in development. It likely didn't help that the economy wasn't particularly strong and would become more strained by the onset of a national depression in 1893. Still, the council had come to an agreement with Workman and Hollenbeck and decided to make a special appropriation to make up the shortfall. 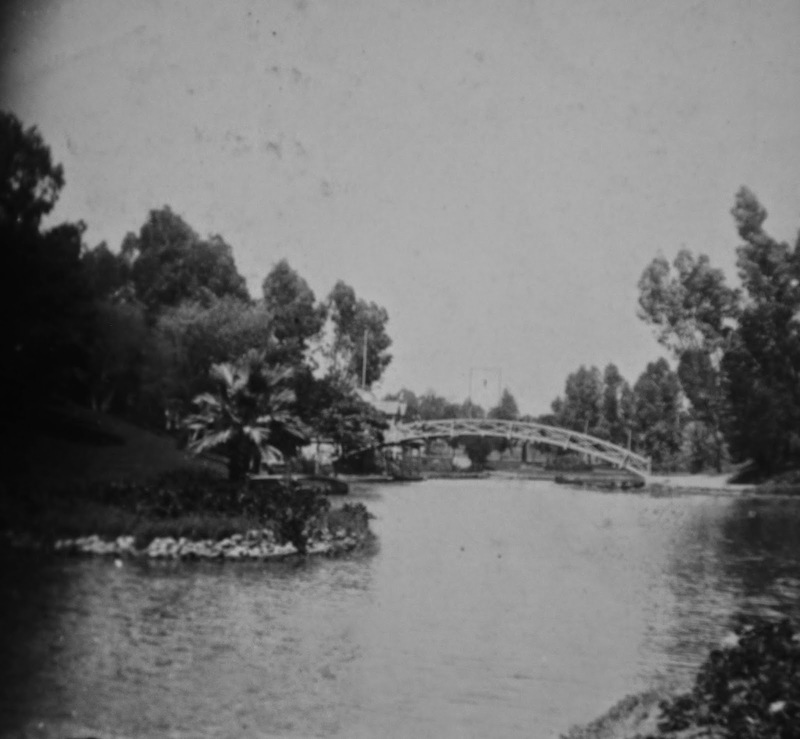 A circa 1890s stereoscopic photograph of the lake and pedestrian bridge at Hollenbeck Park. From the collection of the Workman and Temple Family Homestead Museum, City of Industry, California. The location of the park was a natural arroyo that existed across Boyle Avenue from Mrs. Hollenbeck's estate and a key component of the creation of the facility was the establishment of a dam and reservoir that served as a lake for the new park. The effort to plant trees, bushes and shrubs and grass and lay out walkways, benches and other amenities took some time and the park was dedicated in the middle of 1893. Within a couple of years, a boathouse was established and a franchise awarded for the operation of pleasure boats on the lake. 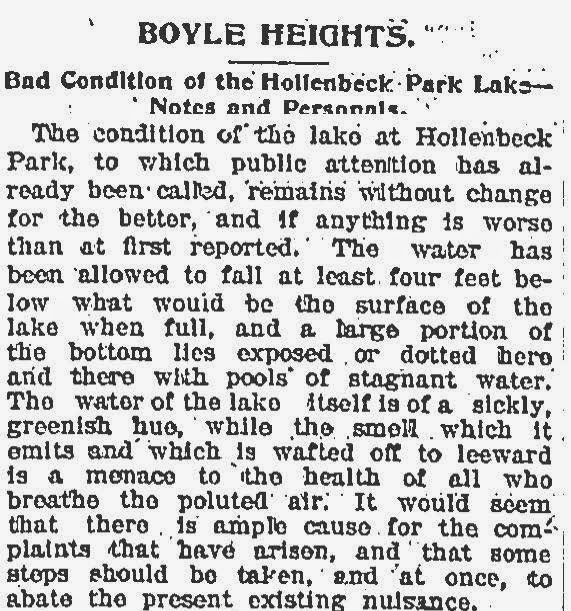 This short article from the 5 August 1894 issue of the Los Angeles Times discusses problems with the lake and inadequate supplies of water that led to a high concentration of algae and unpleasant odors. By 1896, the problem, concerning disintegrating pipe joints that led to water leaking, was repaired and the lake much improved. From the Los Angeles Times Archives Web site. Yet, there were also occasional problems. The major issue in the early years of the park was that some of the joints in the pipes laid to run water to the lake failed not long after completion, indicating shoddy work by the original contractor, so that the lake was not properly filled with water. The city, in 1895-96, had to redo the work at no small expense, but the problem appears to have been solved. In all, though, Hollenbeck Park proved to be a popular and highly-visited amenity for the growing community and this appears to have been a motivation for its benefactors. Workman and Mrs. Hollenbeck owned substantial property surrounding the park and, not long after its creation and opening, the two subdivided their holdings into the Workman Park Tract and the Hollenbeck Heights Tract. 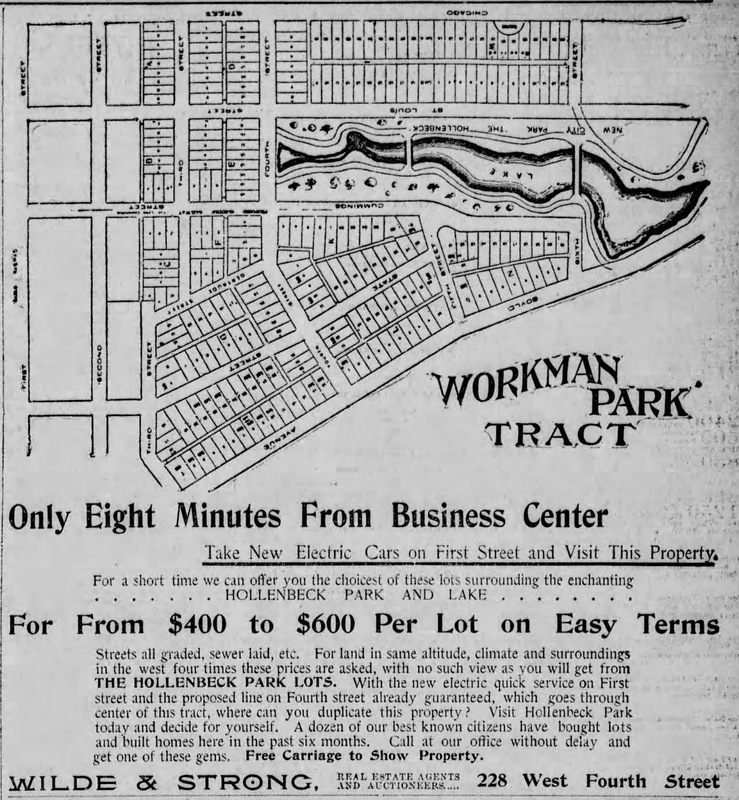 Advertisements for the Workman Park Tract began appearing early in 1896 and always promoted the subdivision's proximity to Hollenbeck Park. In the case of this 15 March 1896 ad from the Herald, a tract map prominently depicting the park was included. Note the reference to the "new electric cars" of the Los Angeles Traction Company line and the fact that the tract was also called "The Hollenbeck Park Lots." From newspapers.com. With the beautiful park as a visible symbol, advertisements for the two subdivisions touted the fact that tracts were adjacent to the park as one of many inducements for investors and residents to buy lots. It does appear that there was some success in selling property in these two developments, even with the substandard economy. Over time, development continued to accelerate near the park and elsewhere in Boyle Heights, although development trends in west Los Angeles and the emerging industrial core of the east part of downtown brought about a transformation of Boyle Heights from a middle and upper class residential suburb to a working and middle class enclave. 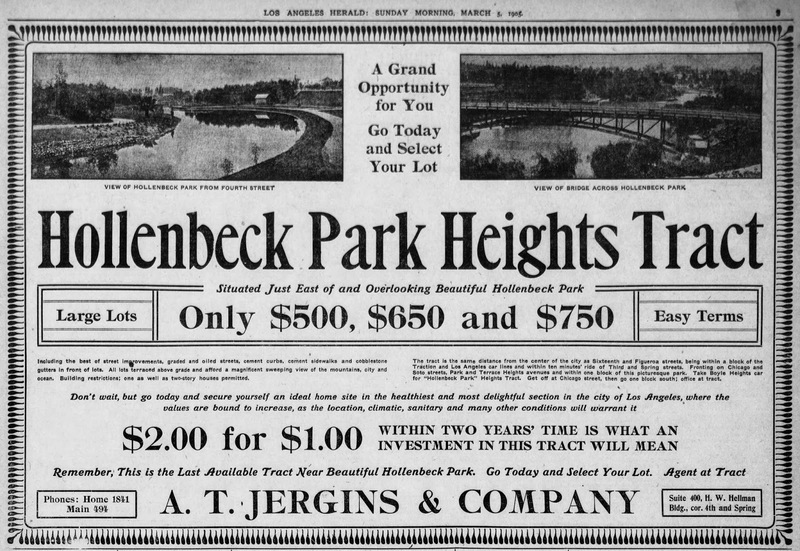 The 5 March 1905 edition of the Herald has an ad of the Hollenbeck Park Heights Tract, subdivided by Elizabeth Hollenbeck, featuring two views of the park to lure prospective buyers. From newspapers.com. Still, this didn't mean that Hollenbeck Park was less utilized or that it didn't remain a focal point of the neighborhood. In fact, it was easily the most visible aspect of Boyle Heights, with many postcards, including real photo cards, professionally published in the first few decades of the 20th century demonstrating its importance. Moreover, the growing popularity of the personal camera meant that there was no shortage of amateur photographs of the park that were taken and many of which survive in private and public collections. Hollenbeck Park approaches its 125th birthday as one of the most notable symbols of the Boyle Heights community. Its gift to the city by William H. Workman and Elizabeth Hollenbeck may have been equal parts philanthropy and business, but it has served and continue to play a central role in the neighborhood's identity. A view of the original boathouse, built in the 1890s, at Hollenbeck Park from a 1914 photograph. From the collection of the Workman and Temple Family Homestead Museum, City of Industry, California. Contributed by Paul R. Spitzzeri, Assistant Director, Workman and Temple Family Homestead Museum, City of Industry, California.